A blood test in the pregnant woman between weeks 9 and 14 of the pregnancy. 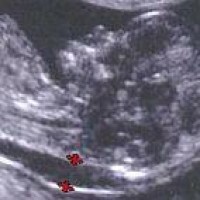 An ultrasound examination (the neck fold measurement), between weeks 11 and 14 of the pregnancy. For the blood test, a sample of blood is taken from the pregnant woman. Two hormones are measured in the blood. With the ultrasound, the thickness of the neck fold is measured. The neck fold is a thin layer of moisture that is located under the skin in the neck. All unborn babies have a layer of fluid in the neck for a gestational period of 10 to 14 weeks, but the thicker this layer of fluid is, the more likely the baby has Down Syndrome. The results of the 2 studies are combined with the age of the pregnant woman and the exact duration of the pregnancy. The order in which the tests are done and the way in which the results are given varies per hospital, general practitioner or midwife. When making the appointment, ask how soon you can expect the result. Sometimes the results are given by letter or by phone. When you get the neck fold measurement after the blood test (and the results of the blood test are already known), you may get the result of the combination test there and then. This is very nice, because it is personal and you can ask any questions directly. If it appears that there is an increased risk of having a baby with Down syndrome, an appointment will be made as soon as possible for a personal interview. Then the possible follow-up studies are discussed. Write down any questions you may have and take them with you when you have the conversation. You may forget your questions due to nerves, so having them written down can really help. If a neck fold of more than 3.5 millimeters is measured for the neck fold measurement, you will also be offered a follow-up examination. Even if the result of the combination test shows that there is no increased chance, you will be offered a follow-up examination, as this may be an indication of another condition. The combination test estimates the chance that you are expecting a child with Down syndrome. With a non-increased chance indicated by the test it's very rare, but possible, that a child is born with Down Syndrome anyway. An increased chance is a chance of 1 in 200 or larger that you are pregnant at the time of the examination of a child with Down syndrome. A pregnant woman with an increased chance is eligible for follow-up research. Increased chance or big chance? An increased chance is not the same as a big chance. Even with an increased chance, the possibility of no Down Syndrome is still greater. This means that most women with an increased chance still have a child who does not have Down syndrome. With follow-up research it can be determined with certainty whether the baby has Down syndrome. The follow-up study consists of 1 of the following 2 studies. The chorionic test; removing and examining a piece of tissue from the placenta. The amniocentesis; removing and examining some amniotic fluid. The combination test is not a guarantee. It only shows the chance whether your child has Down syndrome. A lower chance is unfortunately no guarantee that your child does not have Down syndrome. It is also no guarantee that your child is completely healthy. When you are pregnant with a multiple birth, blood tests do not give a reliable result. Therefore, the combination test with a multiple pregnancy is not useful. It is possible to opt for a neck fold measurement. With the neck fold measurement you get the result for each child separately.